There's nothing better than the sweet aromatic fragrance lavender brings. The distinct sensory smell that evokes a feeling of calm and tranquility is often associated with your favorite soaps, lotions, and essential oils... but ice cream? We've got that part covered. In light of National Organic month, we wanted to give the full scoop on how we carefully craft one of our most popular (and favorite) flavors. You always know when lavender is being made in our production plant because the fragrant smell floods the entire building. We take organic lavender buds from Provence and steep it in hot organic cream for four hours. The lavender infused cream is then strained creating the base of our Snoqualmie Organic Lavender. It's National Organic Month and we're proud to have created the highest quality organic ice cream for everyone to enjoy. The process of creating Snoqualmie Organic took almost 2 years of careful planning and meticulous crafting to create a product that we could stand behind with integrity. We felt it was important to create this line without compromising the taste, texture, quality, and price to our consumer - even if that meant the cost for us would be higher. To us, it was more than worth it. We feel like we have a responsibility to our customers and our environment. As a certified B-Corp, it's baked into Snoqualmie Ice Cream's DNA. Consuming organic is not a trend but a lifestyle that reflects the same values that we have as a company. It's healthier for our bodies and healthier for our planet; that is something we back 100%. Buying organic truly promotes a ripple effect of good in the world and it all starts with you. When you purchase organic, every dollar you spend says YES to enhancing soil and water quality, bettering natural habitats, conserving agricultural biodiversity, and supporting local organic farmers. 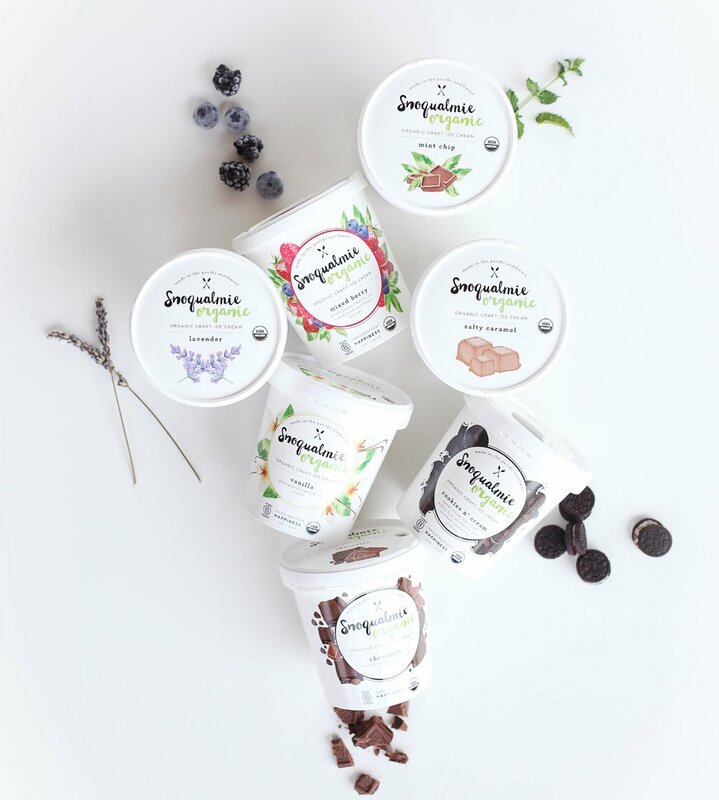 Each pint of Snoqualmie Organic is comprised of high-quality certified organic ingredients that were produced the way nature intended to - free of toxic chemicals from synthetic fertilizers, harmful pesticides, antibiotics, added growth hormones, or GMO's. They say you are what you eat, and we want to make sure our customers are fueling their bodies with all-natural ingredients rather than polluting them with chemical by-products. When you purchase organic, everyone wins. Lets raise a pint of Snoqualmie Organic and give a cheers to all of the organic farmers and manufacturers for being striving to be better for the world. Peppermint ice cream with tiny Belgian dark chocolate chips. Sweet cream ice cream infused with lavender buds. Sweet honey vanilla ice cream with Northwest berries. Sweet and salty caramel ice cream with a salty caramel ribbon. Smooth Belgian chocolate ice cream. Sweet cream ice cream with a hint of vanilla and crushed chocolate cookies. All SALES to Hurricane Harvey Relief - THIS WEEK! Normally, our scoop shop closes on Labor Day, but we've decided to stay open this week to donate all SALES to Hurricane Harvey Relief. Our hearts our broken with this tragic natural disaster and we wanted to find a way to contribute, so come visit our scoop shop in Maltby Monday (9/4) - Sunday (9/10) from 12-8 this week and 100% of SALES will go to hurricane relief. Hope to see you at our Creamery & Fountain!